Coastal monitoring has been traditionally carried out with ground or aerial surveys, eventually integrated by video-systems. Satellite data were not commonly used in local studies, due to ground resolution (in the case of SAR data), observation limitations (eg cloud cover in the case of optical data), and in overall due to cost issues. A new generation of satellite systems, featuring an increased frequency of observations as well as better ground resolution may now offer new possibilities for the replacement/integration of traditional techniques. Almost 40 satellite products acquired from 1992 to 2011 and including also ERS, ENVISAT and ALOS data have been used to study some 130 Km of the Italian coast of the Abruzzi region along the Adriatic sea. This area, located in central Italy, is representative of extremely different coastal environments: from wide, sandy shores, to high, jagged cliffs and narrow creeks, to pebble beaches. Particular attention was paid to the comparison of coastlines extracted from optical ESA TPM observations (IKONOS, KOMPSAT-2, FORMOSAT-2) with coastlines extracted from SAR COSMO-SkyMed data. Automatic extraction of shorelines was carried out by means of object-oriented techniques applied to the optical data, whereas for radar data a "standard" methodology widely applied for C-band data was compared with an innovative approach based on Pulse Coupled Neural Networks (PCNN). 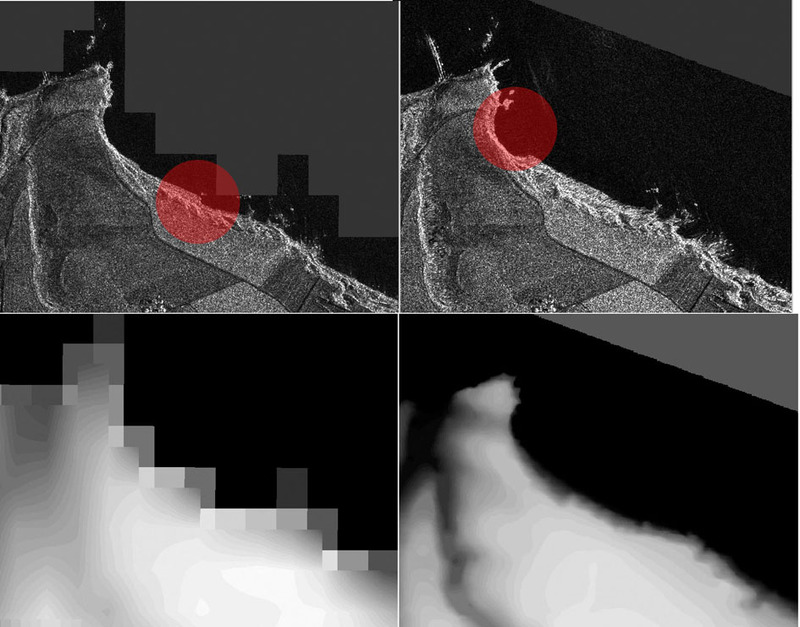 Validation of the coastline automatically extracted from such PCNN technique with a coastline acquired in situ at the same time of the satellite overpass proved the effectiveness of the technique. Issues such as geolocation accuracy of the outcome products, meteomarine conditions at the time of the acquisition, quality of the DEM used for orthorectification of the data, have been considered. Figure 1: The image provides an overview of the importance of the DEM quality in case of medium to steep coast. Both DEM tested in this example (left bottom: SRTM DEM, right bottom: DEM derived from scale 1:5000 cartography) create artifacts on the resulting orthorectified image (top).